Gigabyte is showing off a new and actually useful form factor at IDF, half-height miniITX. If you don’t need the reduced Z, you can always go for a full featured ITX board. There were four boards in total, the two below are the GA-H77N-WiFi and the GA-H77N-WiFi. We know there is only one board in the picture, but since the difference between them are fuses in the chipset that Intel charges you for the privilege of not blowing, we thought one would suffice. For those craving a look, close your eyes and imagine the Z stenciled on the board is an H, and that is what it looks like. We are also aware that you can’t see that stencil, it is blocked by the caps. Chill people. Snide commentary aside, these are pretty slick little media center boards with two flaws. The H77/Z77 chipset will take Sandy or Ivy Bridge CPUs, so it is pretty flexible. They also have dual Wi-Fi antennas and dual LAN ports so you can make nice hub out of it. There is also dual HDMI as well, something of a rarity right now, but highly demanded in certain asian markets. The flaws? Nothing that Gigabyte does, just that the board supports WiDi, Intel’s proprietary, broken, and user antagonistic wireless monitor ‘technology’. It may be incompatible with most everything, but the handcuffs that it imposes supersede its core functionality. The other problem? Intel graphics drivers on a media center box, ’tis to laugh. Our advice? Wait a few days for Trinity to come out in desktop form. The next two boards are similar to the two above but are a little farther out in time. No name on them yet, and given how marketing works, they will likely change before release anyway. The special bit about this is that they are half-height ITX, something that is branded miniITX. 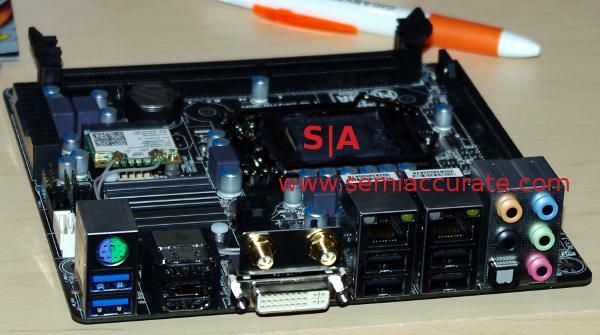 The idea is to make a standard form factor for all-in-one PCs. White box makers wanting to make clunky beasts rejoice!